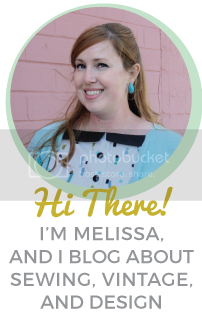 Hello all and welcome to this week’s edition of Thrifty Thursday, where I share my weekly thrift store (and sometimes estate sale, yard sale, or flea market) finds! We found (and were gifted) some pretty awesome stuff this week. 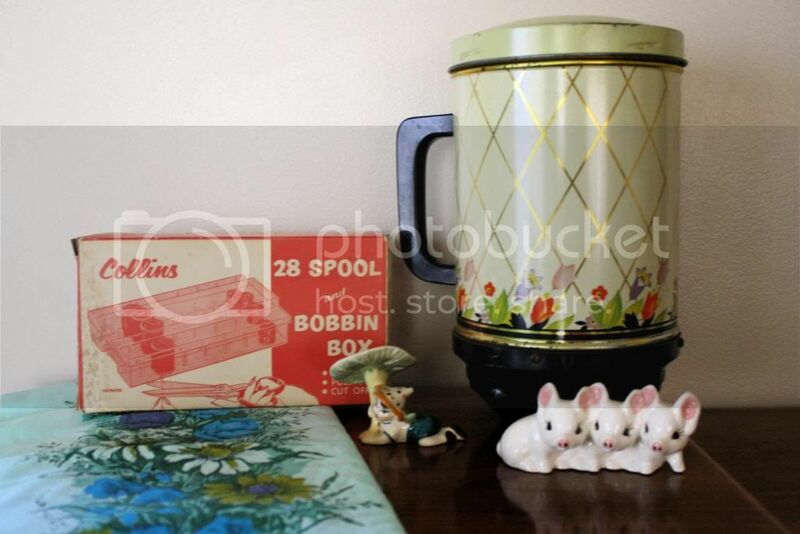 Pictured above, an old bobbin box and some pretty floral fabric, a little elf statue, a “coffee holder/measurer” that my mom found and got for me, and a little ceramic pig statue. 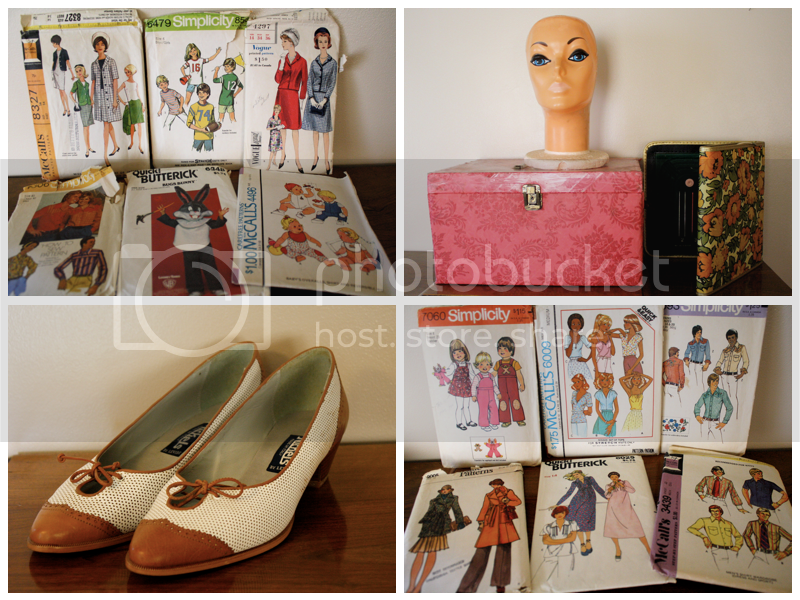 I found a bunch of vintage patterns at New Image, one of me and Phillip’s favorite local thrift shops. I’m hoping to get them up in my Etsy shop soon. We found this cool hot pink makeup case at the same store along with this awesome plastic head (perfect for displaying hats in our antique space! ), and a set of circular knitting needles in a pretty floral case. I found these shoes a few days later at Family Thrift, the thrift store next door to my work. They’re adorable and I wish so badly that they fit me, but alas, they’re a size 8 and I’m cursed with size 10 feet that almost never fit into vintage shoes. I’ll put them in the antique space for some other lucky girl! 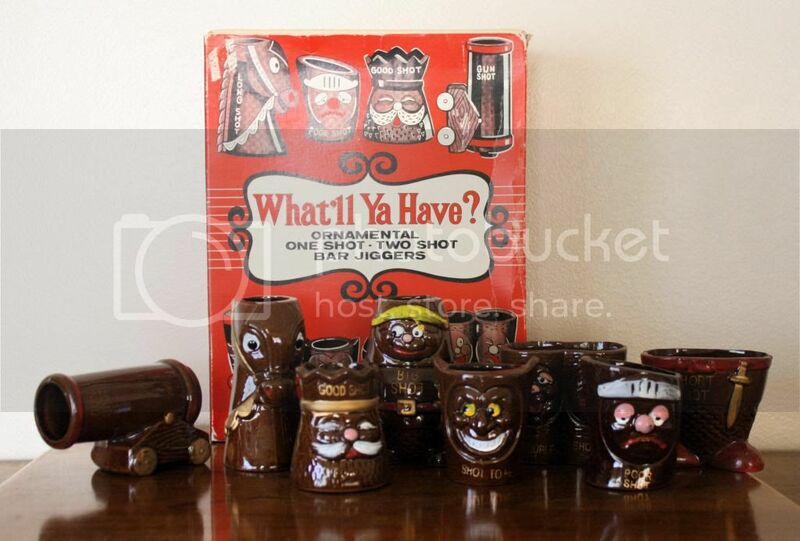 We found this novelty shot glass set a few days later, also at New Image. How amazing is it that they’re still in the original box? We’re debating between putting them in the space and selling them on Ebay. This sewing box was given to us by a friend of Phillip’s mom. The best part is that it’s still full of fun vintage sewing supplies. I’m loving this “sewing club” needle case! Next, we found this cast iron cat. I think there must have been a dish that fit it in that the cat’s paws rested on. A cute piece of crockery, a tiny, sassy bunny, and a brass dachshund- maybe a business card holder? 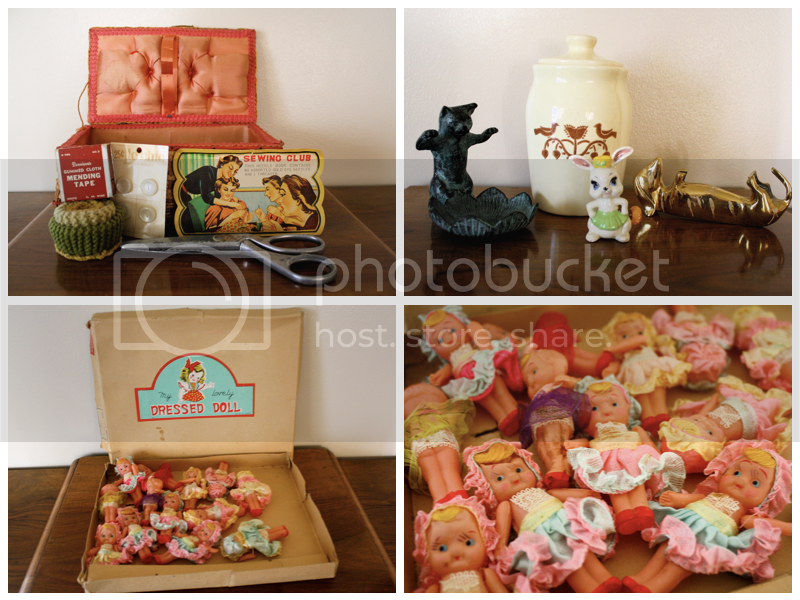 The bottom two pictures show a box of little dolls we found yesterday at New Image. I think we’ll sell them individually in the space, and then I want to keep the box lid! How cute would it look framed in a little girl’s room? The same friend who gave us the sewing box gave Phillip this amazing sign. 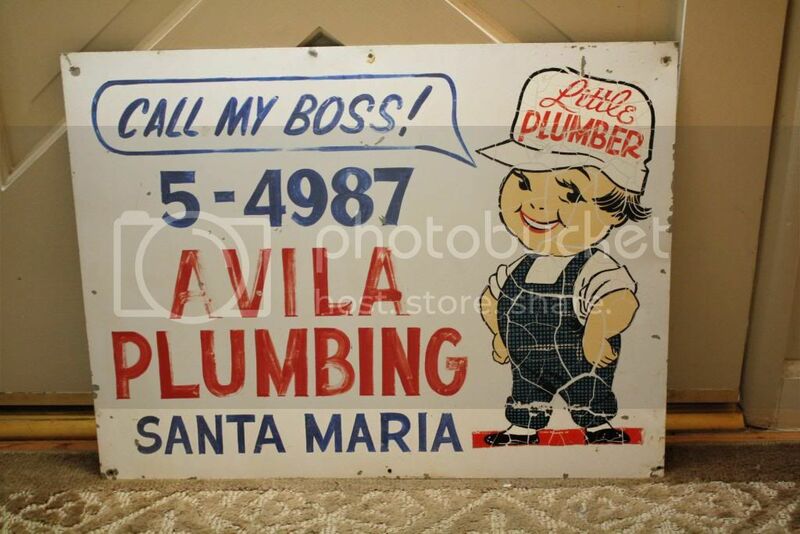 I love this “little plumber” guy! Phillip wants to keep it because of how cool it is and because it’s from the town he grew up in. 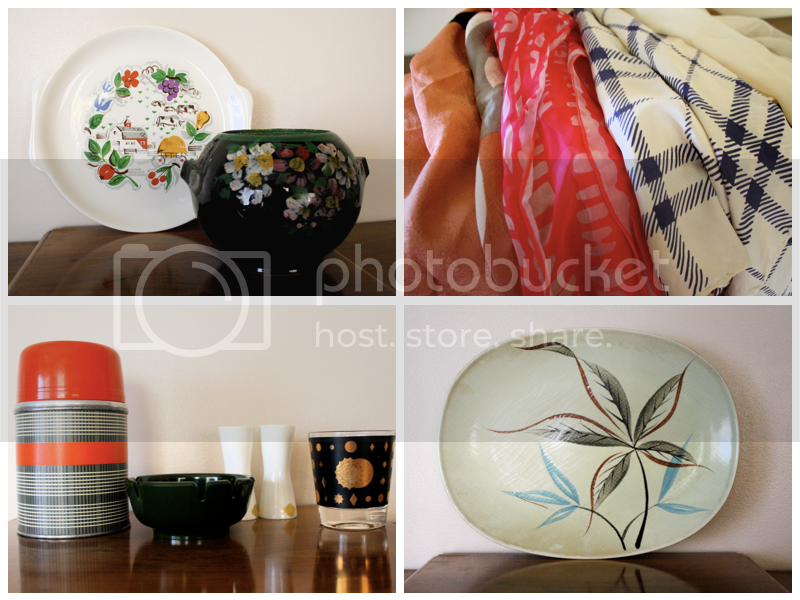 This farm scene platter and black floral flower pot are more New Image finds (that place really rocked this week!). I love the perfectly chipped, rustic look of the flower pot. Next, I found some great scarves at Family Thrift. They sell well in the space when I can bear to part with them! The thermos, bakelite ashtray, mod salt and pepper shakers, and Fred Press glass are from Goodwill. The pretty leaf tray is from New Image too! It’s coated with greasy dust, so I’ll need to give it a good scrub-down, but I loved the simple mid-century design.